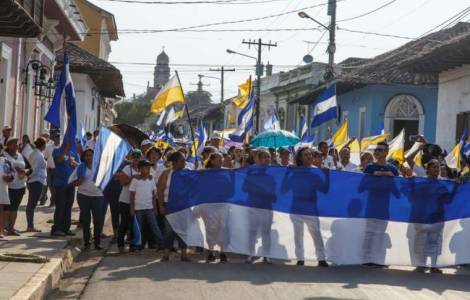 AMERICA/NICARAGUA - The Archbishop of Granada: "Among tensions and violence, the baptized live the message of Christ’s love with profound faith"
Granada (Agenzia Fides) - "In a context marked by tensions and violence, the baptized live their faith, and remain faithful to the message of Christ’s love and to the Church. Church structures are often used as a shelter for the wounded of both parties in conflict": says to Agenzia Fides Mgr. Jorge Solórzano López, Archbishop of Granada. In the archdiocese of Granada, as in other areas of the country, the Archbishop points out, there is now an apparent calm, but there remains the fear of clashes and the uncertainties due to the lack of definitive solutions. Nicaragua has been going through a serious crisis that has already recorded hundreds of deaths for more than a year. The mandate of President Daniel Ortega is in serious difficulty following the demonstrations that took place in the streets for the reform of the pension system. The Caribbean country is heavily afflicted by social inequality, corruption, censorship of certain media and deficiencies in democracy. The Archbishop continues: "Despite the intimidation and fear of being attacked, people can gather for religious celebrations and find strength in faith. The Nicaraguan nation has a great faith in the Blessed Sacrament, in the Virgin Mary and no one can stop this devotion: No one can take our Thursday Eucharistic away from us", he insists.